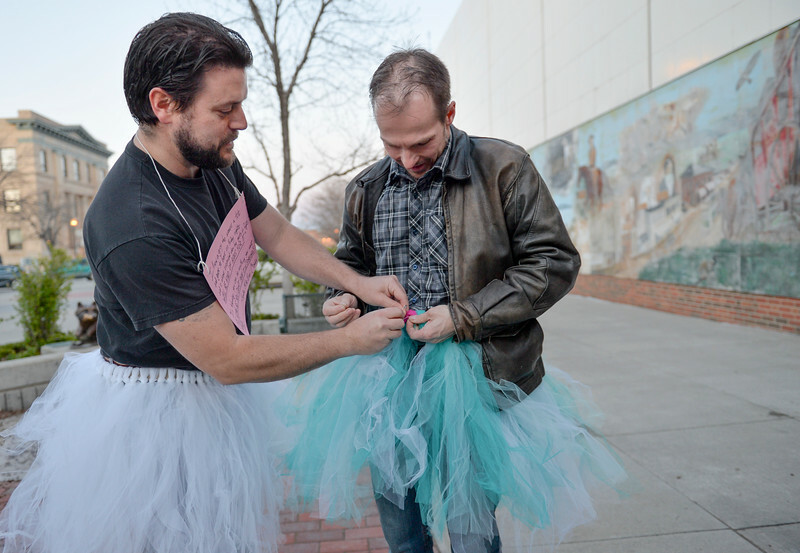 David Myers, left, and Bill Matteson put on tutus before visiting various bars along Sheridan’s Main Street for the “Live and Let Tutu” response Saturday night. Sheridan residents took part in a state-wide response to comments made by U.S. Sen. Mike Enzi, R-Wyoming, to middle school students in Greybull on April 20, when he was asked about federal protections for LGBT people. 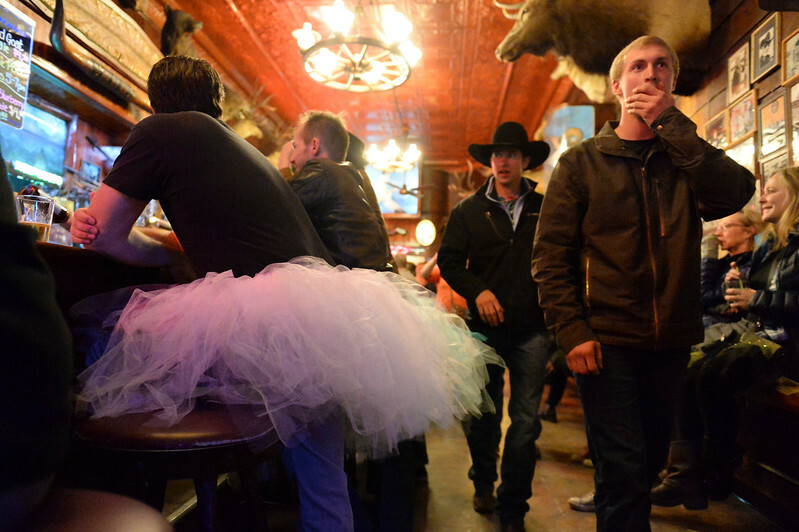 The senator reportedly said that he knows a guy who wears a tutu to bars and and always surprised that he gets in fights, “he kind of asks for it a little bit.” Enzi said. 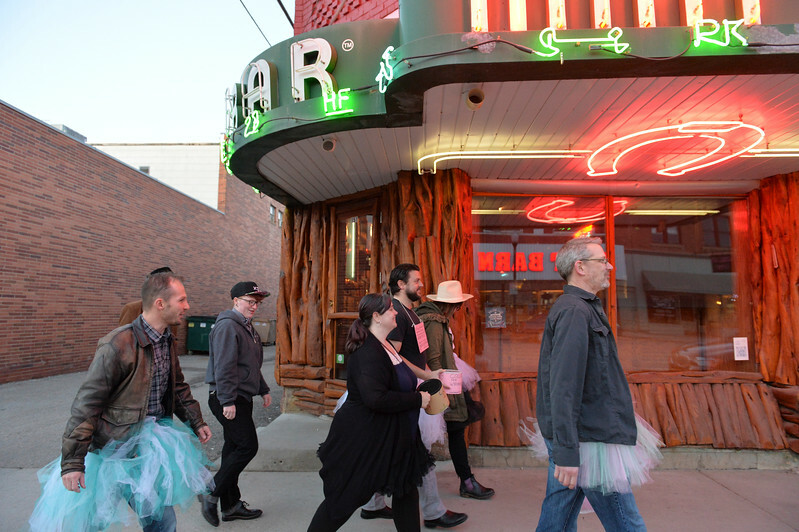 The tutu-gowned group walks past the Mint Bar along Sheridan’s Main Street for the “Live and Let Tutu” response Saturday night. Sheridan residents took part in a state-wide response to comments made by U.S. Sen. Mike Enzi, R-Wyoming, to middle school students in Greybull on April 20, when he was asked about federal protections for LGBT people. The senator reportedly said that he knows a guy who wears a tutu to bars and and always surprised that he gets in fights, “he kind of asks for it a little bit.” Enzi said. Trish Kost, left, and Tamara Davidson visit with tutu-wearing activists Amber Hanson and David Myers for the “Live and Let Tutu” response Saturday night at Frackelton’s. Sheridan residents took part in a state-wide response to comments made by U.S. Sen. Mike Enzi, R-Wyoming, to middle school students in Greybull on April 20, when he was asked about federal protections for LGBT people. The senator reportedly said that he knows a guy who wears a tutu to bars and and always surprised that he gets in fights, “he kind of asks for it a little bit.” Enzi said. 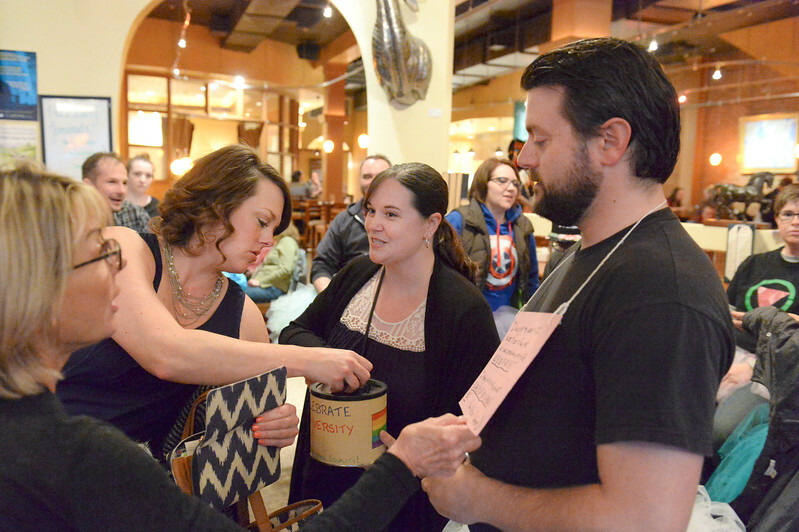 Guests make donations to Wyoming Equality as tutu-wearing activists visit for the “Live and Let Tutu” response Saturday night at Frackelton’s. Sheridan residents took part in a state-wide response to comments made by U.S. Sen. Mike Enzi, R-Wyoming, to middle school students in Greybull on April 20, when he was asked about federal protections for LGBT people. The senator reportedly said that he knows a guy who wears a tutu to bars and and always surprised that he gets in fights, “he kind of asks for it a little bit.” Enzi said. 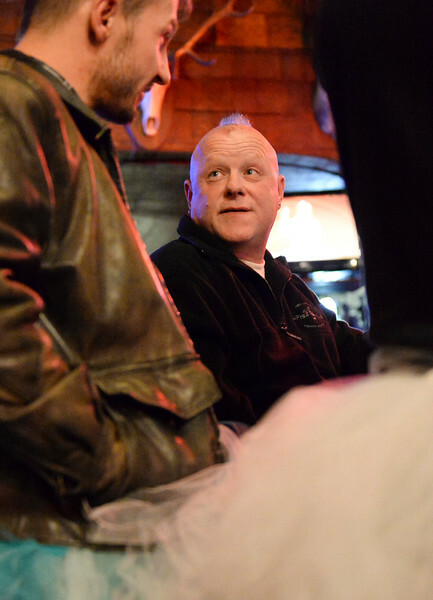 Patron Scott Straessler questions tutu-wearing David Myers during the “Live and Let Tutu” response Saturday night at Frackelton’s. Sheridan residents took part in a state-wide response to comments made by U.S. Sen. Mike Enzi, R-Wyoming, to middle school students in Greybull on April 20, when he was asked about federal protections for LGBT people. The senator reportedly said that he knows a guy who wears a tutu to bars and and always surprised that he gets in fights, “he kind of asks for it a little bit.” Enzi said. Retired Dr. Thomas Hogarty and wife Alice Hogarty leave Frackelton’s during the “Live and Let Tutu” response Saturday night. Sheridan residents took part in a state-wide response to comments made by U.S. Sen. Mike Enzi, R-Wyoming, to middle school students in Greybull on April 20, when he was asked about federal protections for LGBT people. The senator reportedly said that he knows a guy who wears a tutu to bars and and always surprised that he gets in fights, “he kind of asks for it a little bit.” Enzi said. 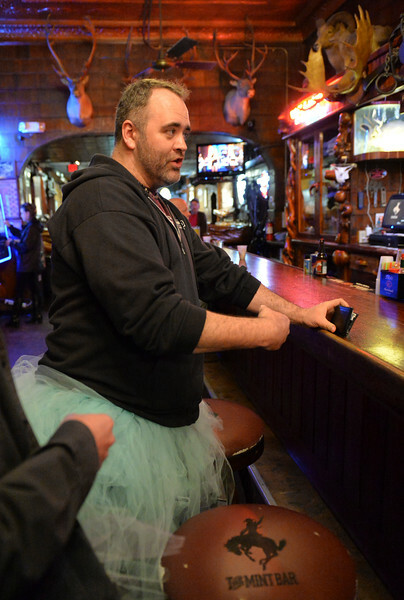 Aaron Odom orders a drink during the “Live and Let Tutu” response Saturday night at the Mint Bar in Sheridan. Sheridan residents took part in a state-wide response to comments made by U.S. Sen. Mike Enzi, R-Wyoming, to middle school students in Greybull on April 20, when he was asked about federal protections for LGBT people. The senator reportedly said that he knows a guy who wears a tutu to bars and and always surprised that he gets in fights, “he kind of asks for it a little bit.” Enzi said. 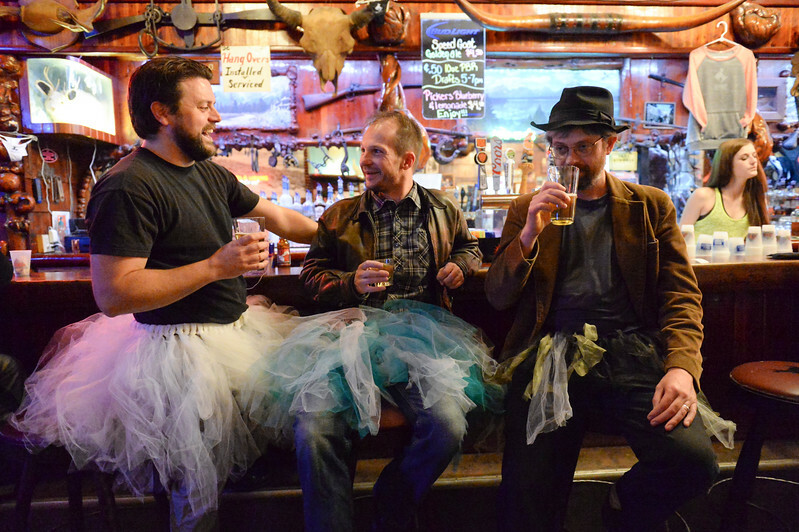 From left, David Meyers, Bill Matteson and Kevin Knapp enjoy drinks during the “Live and Let Tutu” response Saturday night at the Mint Bar in Sheridan. Sheridan residents took part in a state-wide response to comments made by U.S. Sen. Mike Enzi, R-Wyoming, to middle school students in Greybull on April 20, when he was asked about federal protections for LGBT people. The senator reportedly said that he knows a guy who wears a tutu to bars and and always surprised that he gets in fights, “he kind of asks for it a little bit.” Enzi said. 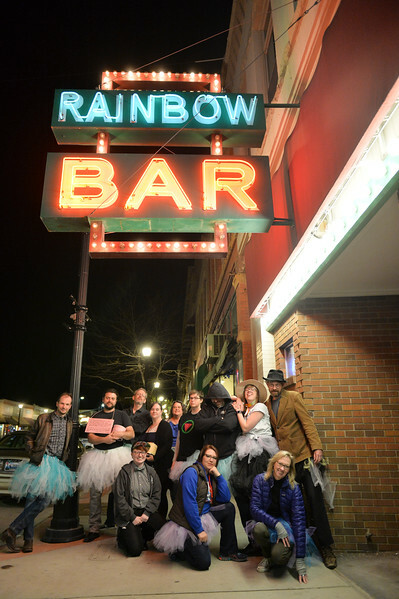 Patrons walk by as tutu-wearing activists enjoy drinks during the “Live and Let Tutu” response Saturday night at the Mint Bar in Sheridan. Sheridan residents took part in a state-wide response to comments made by U.S. Sen. Mike Enzi, R-Wyoming, to middle school students in Greybull on April 20, when he was asked about federal protections for LGBT people. The senator reportedly said that he knows a guy who wears a tutu to bars and and always surprised that he gets in fights, “he kind of asks for it a little bit.” Enzi said. 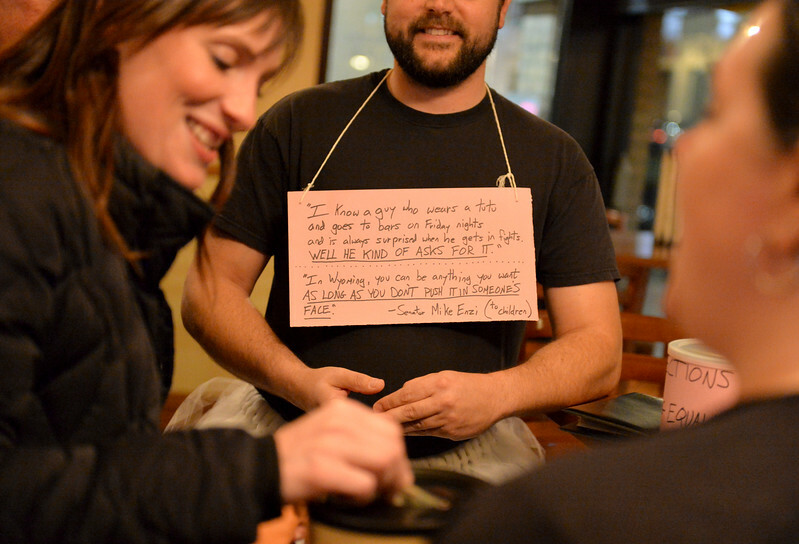 David Myers reaches for his phone during the “Live and Let Tutu” response Saturday night at the Mint Bar in Sheridan. Sheridan residents took part in a state-wide response to comments made by U.S. Sen. Mike Enzi, R-Wyoming, to middle school students in Greybull on April 20, when he was asked about federal protections for LGBT people. The senator reportedly said that he knows a guy who wears a tutu to bars and and always surprised that he gets in fights, “he kind of asks for it a little bit.” Enzi said. 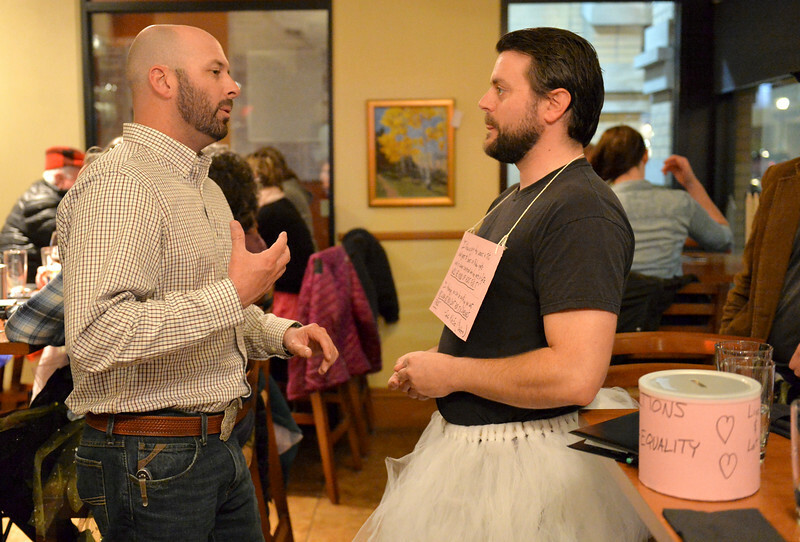 Patron Scott DuWaldt visits with Bill Mateson during the “Live and Let Tutu” response Saturday night at the Mint Bar in Sheridan. Sheridan residents took part in a state-wide response to comments made by U.S. Sen. Mike Enzi, R-Wyoming, to middle school students in Greybull on April 20, when he was asked about federal protections for LGBT people. The senator reportedly said that he knows a guy who wears a tutu to bars and and always surprised that he gets in fights, “he kind of asks for it a little bit.” Enzi said. 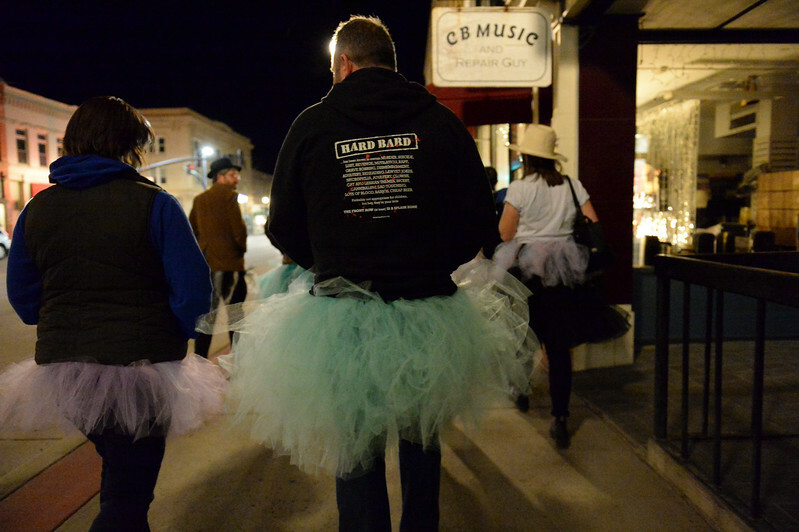 Tutu-wearing activists walk along Sheridan’s Main Street during the “Live and Let Tutu” response Saturday night. Sheridan residents took part in a state-wide response to comments made by U.S. Sen. Mike Enzi, R-Wyoming, to middle school students in Greybull on April 20, when he was asked about federal protections for LGBT people. The senator reportedly said that he knows a guy who wears a tutu to bars and and always surprised that he gets in fights, “he kind of asks for it a little bit.” Enzi said. 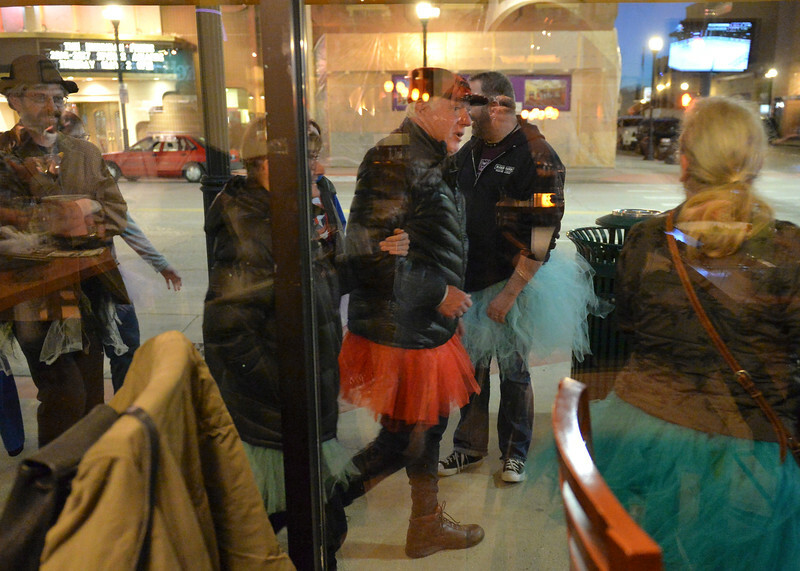 Tutu-wearing activists visited various bars in downtown Sheridan during the “Live and Let Tutu” response Saturday night. Sheridan residents took part in a state-wide response to comments made by U.S. Sen. Mike Enzi, R-Wyoming, to middle school students in Greybull on April 20, when he was asked about federal protections for LGBT people. The senator reportedly said that he knows a guy who wears a tutu to bars and and always surprised that he gets in fights, “he kind of asks for it a little bit.” Enzi said.